Hello there my Korean Cosmetics Junkies! 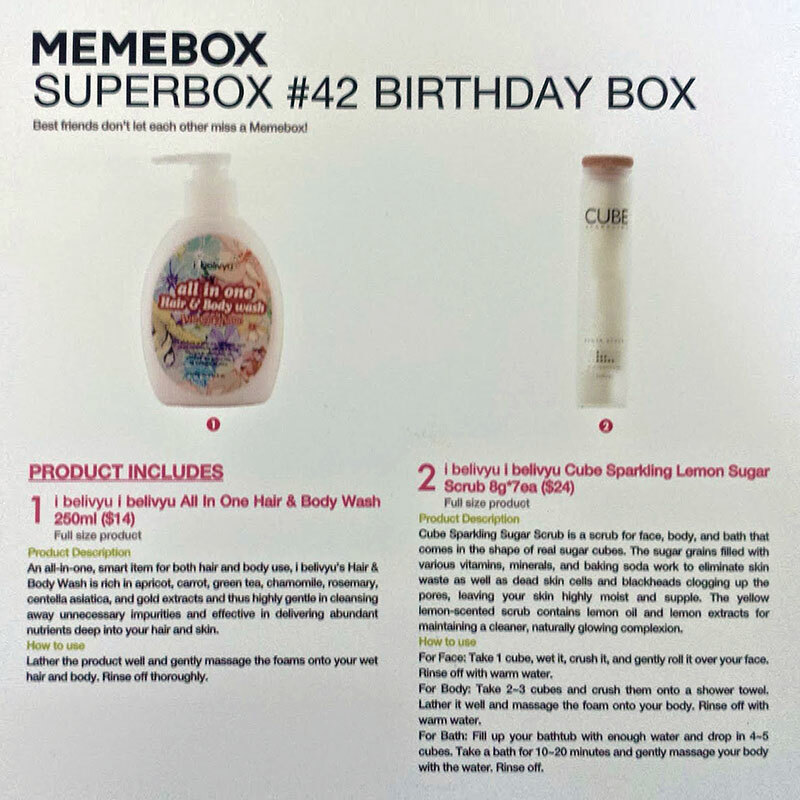 Today I am featuring my review and feature of Memebox Superbox Birthday Box #42! This box would have come in perfect timing if I received it 2 months ago (hint, hint … my cake day is June 9th). Nonetheless, I am truly thrilled to have been given this opportunity to share my perspective. Give the gift of gorgeous for any occasion this July with Memebox’s Birthday Box! Packed with only the cutest and most charming goodies, this Birthday Box will perfectly pamper your favorite gal pals from head to toe! This premium brand features only the most high-quality total spa care products that is suitable for all ages, and for a limited time, it’s up for an exclusive deal only at Memebox! So, don’t miss this limited-time only chance to truly show appreciation for all the favorite women in your life! … okay the photo above looks very pretty and yes, I wish I took it but I didn’t! So how did it look like when I did my own unboxing? … everything looks absolutely fabulous! This box came packaged in a pink bubble wrap while the actual the box looks different from the typical memebox as this one looks like an actual “present” with a medium brown bow on it. i belivyu’s Hair & Body Wash is rich in apricot, carrot, green tea, chamomile, rosemary, centella asiatica, and gold extracts and thus highly gentle in cleansing away unnecessary impurities and effective in delivering abundant nutrients deep into your hair and skin. Major Ingredients: apricot, carrot and plant extracts. Verdict: very smooth and silky to apply and have a rich lather. Easy to use with its “pump dispenser” oppose to those squeeze bottle types. There’s a mild fruity smell that left my skin feeling fresh. The light scent / aroma filled my bathroom and it smells wonderful. I would say it did kind of made me imagine that I am in a spa pampering myself. The bottle is decent size, not too big and not too small. Would I use this product for my hair? I didn’t even try. Personally, I prefer using a separate product for my hair. I’m more of a Shampoo and Conditioner type but I would say this isn’t surprising for me as my husband and I have been to a couple of Hotel’s in South Korea that offers an all in one wash like this product. Don’t get me wrong the product smells really good and I am sure my hair would too but I still prefer to use it as my body wash.
How To Use: lather the product well and gently massage the foams onto your wet hair and body. Rinse off thoroughly. Use of a pouf or loofah is recommended. On the main website for this product (skinsoulbeauty.com) this comes in a set of 3 called “Beach Body Wash”. Aside from this All in One Hair and Body Wash there’s also an Aloe Vera Soothing Gel and an Ice Cooling Body Lotion. How do I like the overall quality of this box? I love it! I would highly recommend this to anyone who would want to give the gift of pampering to someone special. Personally however, I wished I have received Memebox's skin care products as I am more of a skin care fanatic than body care. Ready to own your very first Memebox? Then check out the following Promo and Discount Code to save! Make sure to purchase your boxes fast as they are first come, first serve ... and once they're sold out they're gone! I haven’t heard of Memebox! I am definitely going to check this out. Thank you for sharing. Awesome review loves! Very thorough and I totally love all of your pictures. Excited to see your video update for these products. I love korean skin care products but I am not familiar of Memebox at all. Thank you for this info now I have a new place to shop at. Fantastic review by the way. You did an amazing review for Memebox’s birthday box! Totally enjoyed the detailed information. More reviews please! Beautiful review loves! I wish you more success to your product features. 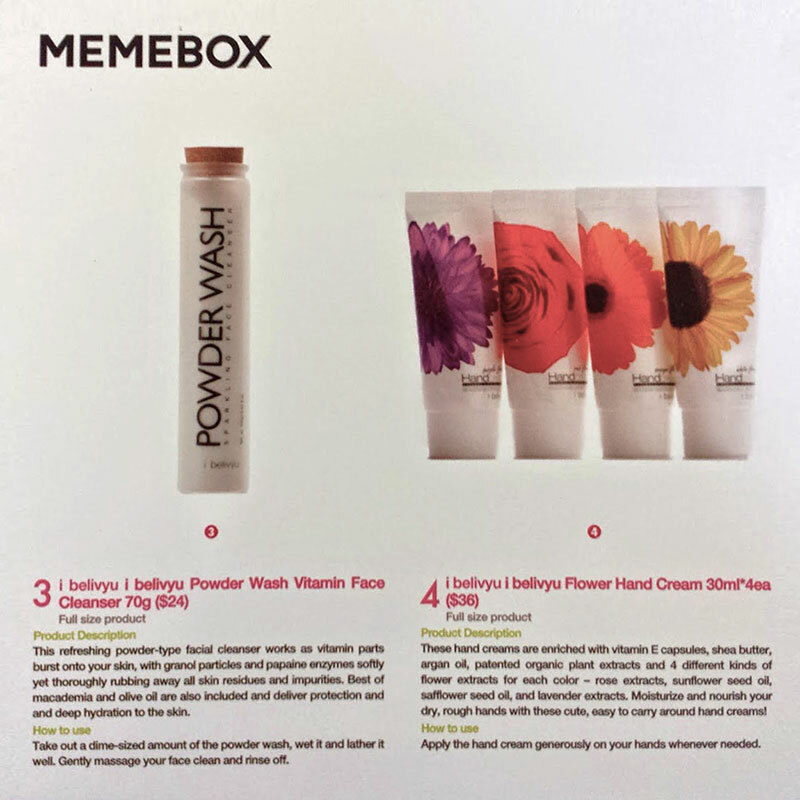 I enjoyed reading about Memebox and their Birthday Box edition. I don’t know about Memebox at all. I’m surprised I didn’t hear about them sooner. Thank you for the feature review! Hopefully you can review more of their products! Awesome review! I am definitely adding memebox to my shopping sites for korean products. Thank you for the review and feature hun. Fantastic post! Please do more korean product reviews so I can check those out before I make my purchases. You are fantastic! I love your product reviews. More pictures please? That cube looks delicious to look at! I’m in love with Korean skincare products! Thank you for introducing Memebox to us. I want those cubes! They look like candies. I am going to check memebox definitely.